Building a Wide Track Wagoneer.. Finally! I guess it is about time to start a thread.. Realizing I was never going to get this thing done on my own, I have turned it over to Page Customs outside of Richmond, VA. They have the rear flares roughed in. Thy will strip the body, fill all the holes from rivets and roof rack, prep and paint. I will keep the color to myself for now. I can't afford to have the shop do everything I would like, but it will be a giant leap toward the vision I have had for many years. They will update it regularly with progress, which I appreciate since I am up north and they are outside of Richmond, VA.
1. I have a set of '09 Grand Cherokee Overland seats that I want to use. Looks like this will take some engineering. Based on initial mock-up, I told the shop that I would work on that part when I get it back. I can't afford $100/hr for them to play trial and error for mounts, etc. 2. I want to integrate a few things into the dash that resemble the older ones. I was going to do a complete swap, but the HVAC, etc. and timing are a concern. We will see. 4. A roll cage /safety cage will be built, but I am taking it to a specialty shop to do that. I am not building a race cage. I want it to minimize intrusion into the passenger compartment while providing protection from roll-over. It will be set up so that it can be taken out if needed to get to headliner, etc. and tied into the frame. There are other details in the plan, I will share as we go. The axles are from a late model J20 sitting on BDS 4" springs. I took them to East Coast Gears in NC to be rebuilt. They did me right on building a new rear D60 after finding the bearing races in the one I bought had deep spiral grooves in them. They used their new center and installed very heavy duty tubes at proper length and set it all up to bolt directly into the GW at what I felt was a very fair price. They also built the front. Rear has disc brake conversion and a Grizzly locker. The front has a TrueTrac. I went with 3.73 gears instead of the 4.10's that were in the D44's. This will put the engine at slightly lower RPMs for highway cruising but still work well for any towing I may do. For now, drive train remains the same: Golen-built LT1, 4L60e, with a NP242 with SYE (I wanted to AWD capability to still be there and 242 had AWD, 2WD, 4H and 4L). I would love to upgrade to a 6.0/6L80e but that will have to wait on funding. If my trans gives out on me (it is showing signs) I will have to decide on putting more money into it or taking the plunge. The 4L60e on the back of the LT1 (95-96) is not compatible with the later 2-piece cased 4L60's. Last edited by jpswapmohn on Mon Oct 15, 2018 4:50 pm, edited 1 time in total. 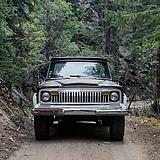 Re: Building a Wide Track Wagoneer.. Finally! Oh awesome, be cool to have another super chief. Man, I love Super Chiefs... Subscribed, their work looks awesome. Good luck with the build, please keep us posted on the progress. Subscribed!! Looks awesome so far, can't wait to see how it finishes! The shop decided to use the early front valence that i dropped off with the jeep instead of putting tabs in the original for the round headlights. I was worried that the older valence would have significant rust when they blasted it, but turned out to be quite solid. I was pleased to find no rust under the windshield, etc. as they disassembled her. I knew the body was straight, but wasn’t sure if any rust had cropped up in the years since i bought it in Boise, ID. The shop has said several time how surprised they were at how solid it has proven to be as they have stripped it and cut out metal. Guess it pays (literally!) to start with a solid rig. I also asked them to save the metal they cut out of the rear of the quarter panels in case anyone in the community needs/wants them for repairing rusted out areas behind your rear wheel wells. I go see it on 31st and have to make a decision on interior so the dash pad can be dyed or recovered. Amazing. This is on my bucket list for later in life. I even have an 83 Cherokee that will be donating axles Tcase, fenders etc. Following! Really beautiful job so far. Can’t wait to see it finished. Progress continues. Mocked up the 69 dash and it has gone in for first time, VA Gen IV Mag is bolted in as well. Last edited by jpswapmohn on Mon Oct 15, 2018 4:51 pm, edited 1 time in total. The cage is going to have to wait awhile due to the reality of my funds. I have great dreams, but the savings account and the household accountant keep me in check, literally.. It will get a cage, as I have seen too many photos of what our GW’s look like after a roll over. It will just have to wait until the body/paint are done. Same with the upgraded interior. They are modding the dash as part of the build and I needed that done while the build is in progress. So, I had to hold off on my vision of minimally invasive cage and the dark brown leather interior that it will eventually have. I am going to be so upside down in this rig, but I am trying not to care as I can’t see ever getting rid of it. The cost, when really done will be close to or exceed that of a new similar modern SUV. I try to tell myself that is what it is replacing. Disregarding drivetrain, I will be north of $35k when it is even back on the road, without the interior upgrade. Never thought I would be paying a custom shop $100/hour to build my dream, but here I am. I envy you guys that can do this own your own, I just realized that was not going to happen for me while I am still able to enjoy the results. Wow, it looks great and like you said "its getting done". The FSJ has character-not like the SUVs of today!! Looking at this photo, I have a question: what is the weatherstripping going to seal against? ProTouring442 wrote: Looking at this photo, I have a question: what is the weatherstripping going to seal against? I'm guessing the pinch weld. The seal mounts on the pinch. Based on the other pichers it looks like they didn't change the mating area on the door. Many will recognize the dash. It is a close approximation of BigJ200’s. Why mess with something so right? I even ordered the same radio. It is starting to take shape! I'm just blind... didn't see the pinch weld was still there. Now, where did I put my glasses? This is going to be sweet when done. Can't wait to see it finished. A little Sunset Mica Bronze, anyone? Just the doors, but we have COLOR! I ordered mirror mounts from Ross with a chamfer around the mounting surface. Would like to get electric mirrors to work in them, but we will see when they get here. I need to order M-i-B’s interior ABS panels, but need to make sure I can pay the body shop through completion first.. I am learning that in the real world of car building, compromise is part of reality.. If I had an endless budget, maybe not. But I am just a working guy. We will get the important stuff done and the rest will have to come in stages. I have been amazed at how quickly I have burned through what I thought was a pretty stout budget. But, reminding myself that I have had the rig for 14 years with great intentions...now it is actually getting done, just through someone else’s more capable (and rightly more expensive) hands. 69 dash with modifications similar to BigJ200’s. We went to a Vintage Air Mag Gen IV (which i am still amazed at the compact size of!). Modified the steering column mount area so the XJ column set in correct place. Modified the plastics piece that went under the late model steering column to go on the old dash. I think it looks pretty good. Since I went to a hazard light button on the dash, a piece of exhaust pipe was used to make a surround for the steering column to clean it up some. I always hated those hazard pull tabs on the columns. Probably too much time in Europe where the hazard button is prominent on the center of the dash. We ended up going with push-button switches instead of the large toggles. The gallery with buckets of pictures of progresss.. the dash work is kinda scattered throughout. This includes the shops pictures and some I have taken during visits.